tonight, everyone is asleep. the house seems quiet but i can hear millie snoring, the ocean sound machine keeping the beana lulled into rest, joshua radin serenading me so i do not feel alone, my fingers move move moving to share these words, my body's rhythm through my breath inhale exhale repeat repeat. there is so much i want to tell you. so many stories that have been shuffling about inside me, for months or is it years. stories that are stacking up and now have begun to spill over. i am feeling moved, perhaps pushed, to share them here...tonight, i begin with a moment from last week. one foot in the dark. one foot in the light. now i try to navigate trusting it all. moments later, i sat in this same spot i sit now while the beana slept and said aloud: i need to make myself a boat. and with that i found myself grabbing an old wool sweater, tying a shawl around me, sliding on handwarmers, and gathering all that i needed to set up the table on the back porch so i could paint a huge canvas that had been leaning against a wall in our family room for about four months. 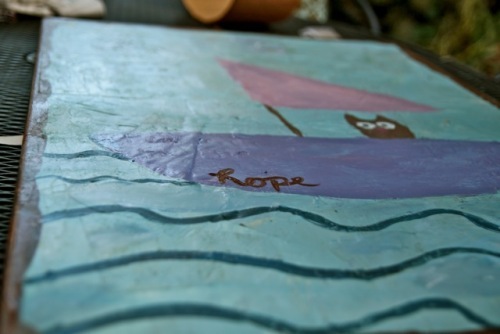 i pasted vintage paper and a map and other things to that canvas, piled on layers of gel medium, and took a pencil and wrote a letter asking for what i needed in that moment. these words aligned with many others. choose, let go, live... line after line. and then i painted over all of it with a color i mixed until i found seaglass. as i mixed that paint, i just kept talking to the universe. i give you this because i can no longer carry it. i choose hope. i choose rest for just this breath. and then the boat i needed appeared. just a silly little boat with a simple passenger watching the world, navigating it with her wide open eyes, seeking, searching, hoping. while my little one napped, i found my way to remembering what i know. i let go of the chatter that rolls around inside me to remember the joy waiting for me when i give myself what i most need. when i give myself the gift of seeing me. i think i need a boat, i said. and now, as joshua radin sings and the ocean rolls and my foot tap tap taps, in this moment, just before i stand up and dance inside this truth, i let go of holding it all, and i choose to trust for this breath, then the next, repeat repeat repeat.